No film shamelessly advertised with the tagline "Part Heaven... Part Hell... Pure Havana" can possibly be all good. 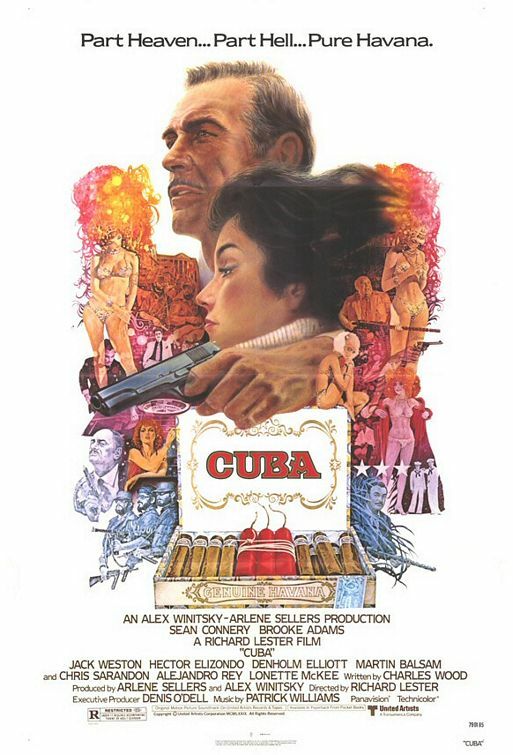 To be fair to 1979's Cuba, though, it's nobody's fault but the marketing department's that they heard "Sean Connery plays a British government agent..." and immediately tired to figure out how to sell this cool and slow-moving anti-romantic anti-thriller as a distaff James Bond picture. But it's unlikely that it would have been possible to sell it as the thing it actually was. Not because Cuba is uninteresting - exactly the opposite. But its interest is in part because of how thoroughly unusual it is, to the point that it sometimes breaks the movie. It is none of the things that it seems like it should be, and while that's great for its personality, it's a bit thorny for it as a movie for people to watch. The setting is Cuba, in the weeks and days immediately preceding the revolution on 1 January, 1959 (the film has the misfortune to commit its most profound error as its first narrative gesture after the opening credit sequence: onscreen text sets the action in 1959, when virtually all of it happens in December, 1958. It's a shockingly obvious mistake that makes it hard to take anything that follows entirely seriously). Connery's distinctly non-Bondian character is Robert Dapes, a miltary officer turned mercenary, who arrives in the politically tense Havana on the invitation of Batista's government in the form of General Bello (Martin Balsam), to offer advice and support in suppressing the Communist rebellion of Fidel Castro. While there, he encounters Alexandra Lopez de Pulido (Brooke Adams), an ex-lover who has returned home to marry a wealthy plantation owner, Juan (Chris Sarandon). While in the country, Robert finds that the exploitative business classes picking at Cuba's bones are cruel enough that it's not worth using his time to help prop the old regime up, while the Communist guerrillas are too indiscriminate in their radical violence to support them. Which leaves only "stay alive long enough to get the hell out and take Alexandra with" as far as plans go. That is, mind you, the summary version of the script by Charles Wood. The actual film has far less direction, spending a good half of its running time looking around pre-revolutionary Cuba, frequently not even using the fig leaf of Robert's presence. At times, it's barely a narrative at all, and when it is, it's a deliberately unsatisfying one, subverting the expectations of both of its main plotlines: the politically shiftless mercenary who discovers the human element of the system he's cynically inhabiting, and the open Casablanca riffing (like, really, really open) inherent to ex-lovers reuniting against a politically-charged backdrop. It's an unconventional approach to what could easily be yet another in the endless line of movies about doomed love during historical flashpoints - the approach taken in this very same setting by 1990's Havana - and the film deserves plenty of credit for its bravery. The question, then, is whether it deserves points for its execution, and on this point I am quite undecided. It's not exactly right to say that the film's "problem" is that it was directed by Richard Lester - in fact, Lester originated the project, so the alternative to a Lester Cuba is no Cuba at all. There's no way around it, though: he's a weird fit for the material. All of the director's best-known and most significant projects - the Beatles vehicle A Hard Day's Night, Palme d'Or winner The Knack... and How to Get It, the Salkind-produced megaproduction of The Three Musketeers - are united by a goofy, kinetic sensibility, one that oozes an unspoken "holy crap you guys we're making a mooooooveeeeeee" glee, entirely about having a whole lot of broad fun even when the films in question aren't comedies (though he tends to blur "comedy" and "not-comedy" - this is the man who was assigned the scraps of Richard Donner's Superman II and figured out how to turn them into the first superhero farce). The only one of his films besides Cuba that I've seen without any meaningfully protracted comic energy is Robin and Marian from 1976, his other collaboration with Connery, and that is, when all is said and done, a Robin Hood movie. The skill set that Lester had developed over his years as a filmmaker were, then, not by any means a natural fit for a serious drama about a real-life political event whose ramifications were still piping hot twenty years after the fact. I do not say this to beat up on Cuba, merely to point out what a peculiar beast it is, combining gorgeous Spanish locations, impressively sober and dirty cinematography by David Watkin, and meandering incidents that are more interested in the day-to-day lifestyle of the characters than the historical moment about to overwhelm them, all under the stewardship of a director who has to constantly fight his instincts. Eventually, he loses: one of the most unpredictable elements of this surprisingly unpredictable movie is that the final act turns, rather abruptly, into an action-heavy tank battle. It's staggeringly unacceptable at the level of both plot and tone; imagine Casablanca tossing in Saving Private Ryan's finale before it returned to the airport finale, and you have approximately the cinematic aneurysm that Cuba transforms into. But it's still not played for laughs. Conceding all of that, the lumpy, internally confused Cuba that we have is rather more aggressively magnetic and compelling than a more streamlined Cuba by a more superficially appropriate director. I mean, we have Havana right there, and Havana is dullness on toast. Before its diversion to the tank finale, Wood's script is strong at the level of thoughtful observation, laterally comparing several elements of Cuban government and culture to try and paint a full picture of everything good and bad about both the pro-Batista and pro-Castro elements of life on that island in 1958. That it fails to plug these ingredients into a clean narrative structure isn't beside the point: it is the point, much as the repeated failure of Connery to ignite as the daring, competent man of action we expect him to be (until, again, that damn tank) is the point. It is a film about how the smart outside observer, virile and capable, is sometimes exactly the wrong solution to a problem, whether that problem is with the fate of nations or the life of a woman trapped in a hurtful marriage of economic convenience. With a stronger actress in Adams's place (ideally one who was actually of Latin American descent), the film could have presented quite a strong anti-romantic thread to go along with its anti-Bondian portrait of the British warrior as hapless victim of historical undercurrents. As it is, it's more theoretically interesting than actually interesting, but it's still bracing to see something puncture its genre so fearlessly, especially one whose aesthetic is, generally speaking, so in line with conventional crowd-pleasing instincts. It's about worthy of the re-evaluation called for by Steven Soderbergh (a longtime devotee of Lester and director of his very own picture about the Cuban revolution): as a deeply flawed movie whose historical inquiry and willingness to complicate the genre it appears to inhabit make it much more valuable than its original reception was willing to admit.